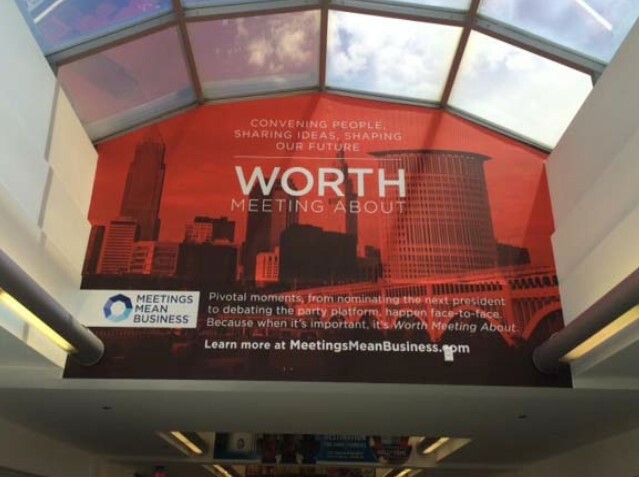 Meetings Mean Business made a splash at the Republication and Democratic national conventions with its “Worth Meeting About” campaign, which launched on June 1. The timing and settings in convention host cities Cleveland and Philadelphia were perfect for showcasing the value of meetings in bringing people together. Signage met visitors as they arrived at each city’s airports and continued on billboards along I-95 in Philadelphia. “We were able to get the visibility we were looking for,” Dominguez noted, and the messages were “well coordinated and well timed.” Ads online were “geo-targeted” to the host cities to maximize their visibility and overall impact. A campaign hashtag also began on Twitter (#WorthMeetingAbout). Additional ads are being featured in several print publications, and materials for coalition members were shown for the first time at the Destination Marketing Association International meeting in Minneapolis. The kick-off was just the start of MMB’s efforts for this campaign. Until Election Day in November, MMB plans to highlight the different types of in-person meetings that are taking place — debates, town halls and rallies. These events and their outcomes will be used to show that while elections only happen every four years, meetings take place and positively impact people, businesses and communities all the time. Worth Meeting About will “hammer home the message” again during IMEX America in Las Vegas, said Dominguez, whose meeting dates of October 18-20 coincide with the final scheduled presidential debate in that city on October 19. • Publishing blog posts and op-eds on the role face-to-face played at the national party conventions and presidential debates. • Developing new materials for coalition members (including a “Path to the White House” infographic). • Using social media to expand the reach of key messages online.